I find the concept of expectations and whether or not they are met to be fascinating, especially in regards to film criticism. Last night I finally saw the 2002 Best Picture winner A Beautiful Mind for the first time, a mere 12 years after its release, and without a doubt it is a very good film, one that was elevated to that level through pretty great performances throughout but especially from the two leads. Russell Crowe is John Forbes Nash Jr. and Jennifer Connelly is Alicia, a student in his class that stuns Nash not just with her beauty but also the bold move she makes to solve a noise/temperature problem on his first day as her teacher. I truly did enjoy the film, yet the tone of this review will sometimes be negative because in the end, when a film wins Best Picture it is bound to be held to a higher standard. Because of the lengthy amount of time since its release and the numerous viewings I have had of its competition at the 2002 awards, it was virtually impossible for me to avoid comparisons to other, not even remotely similar works, but I tried really damn hard to block those thoughts from my mind and enjoy what was being presented in front of me. I really did try, but I failed. I have absolutely nothing against Ron Howard, in fact I am a fan, but I can't wrap my mind around how his directorial efforts here were awarded the highest honor over the work of other nominees like Peter Jackson and his handling of the first Lord of the Rings film, The Fellowship of the Ring, or especially the truly brilliant achievement by David Lynch with Mulholland Drive. I thought I would never be shocked again by this specific category after I was practically catatonic when Tom Hooper stole the award from David Fincher in 2011, but despite it being a trophy handed out nine years prior to that, I am almost just as baffled yet again. Howard does a fine job handling the material, but for the most part it is a film that does nothing exceptional beyond the performances. Crowe plays the awkward role with fantastic presence and authenticity, especially during the first two acts when he is younger and is forced to deal with the balancing act of what plagues his mind and the progression towards some sense of normalcy through love and various friendships. Connelly truly is captivating in the film even when she is doing nothing at all, which is one thing that I did think Howard excelled at, allowing his performers to steal the scenes and stand out amongst a crowd. During the scene in which we are first introduced to Alicia, I normally try to observe every aspect of a frame and quickly appreciate the placement of everything included so I can better understand the importance of mise en scene in the moment, but I don't remember a single thing inside that classroom aside from Connelly, as she brought genuine beauty and warmth to a moment that changed the course of Nash's life. What stood out for me on the negative side was the third act of the film, which felt absurdly cookie cutter and sappy to the point of making the entire conclusion of the work feel downright phony, and this is coming from a person who doesn't fully know the true story of Nash and what really transpired during the more recent years being portrayed. After an intense examination into both aspects of his beautiful mind during most of the film, the utter brilliance and also the demons he battled, everything challenging and gritty and real seemed to be swept under the rug in order to present an "Aw shucks, so glad everything turned out great for those lovebirds!" happy ending, and I just didn't buy into it like I did the rest of the story. It felt like an ending that a test audience told them to go with to avoid any sort of hard truths and consequences because people love to exit a theater smiling and feeling warm, but what works for me is cinema that pulls me in during its entire running time and makes me feel like I am witnessing an honest depiction of actual events, not just 66 percent of it before turning on the schmaltz. 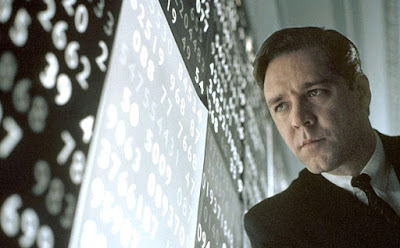 A Beautiful Mind is a film I really liked that I expected to love, so in the end my expectations failed me, yet I have seen far worse works that left me feeling positive about the experience because I anticipated dread and yet discovered some delight. Whether it is fair to come down so negatively on a film for falling short of its Best Picture level status while praising a lesser film for surprisingly me with some fun, I'm not sure, but when you give a film a trophy for being the absolute best achievement from an entire calendar year I expect an incredible, moving and unflinching example of how cinema is meant to be, not just another addition to the massive pile of the very good.